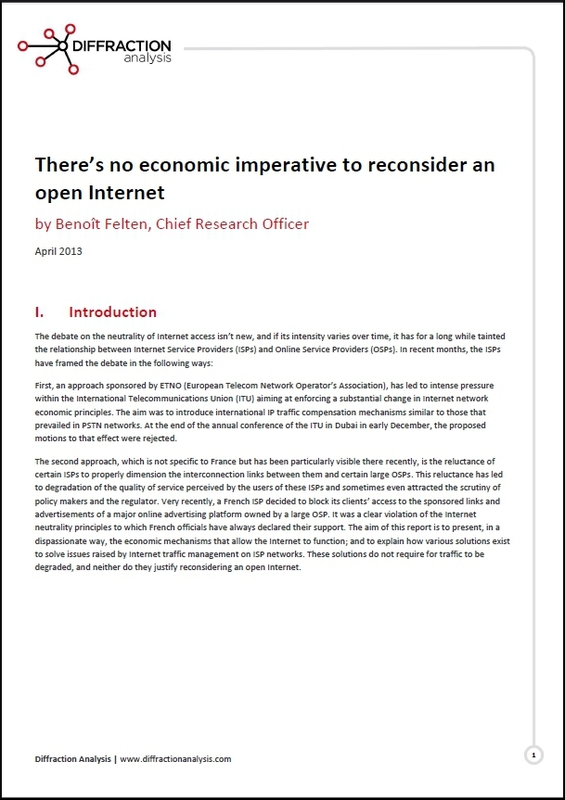 Arguments suggesting that the economic viability of the Internet is unsustainable without the Online Service Providers paying the Internet Service Providers for traffic are not new. In 2011 Diffraction Analysis published a report entitled ‘Net Discrimination Won’t Buy You Next-Generation Access‘ where we explored some of these arguments in relation to access network investments. This is an important paper (we think) because in the debates around Net Neutrality there is a lot of complexity and many half-truths. Our conclusion is that the situation is nowhere near as dire and complicated as some would make it out: solutions to fluidify traffic with limited financial impact on the players involve exist and can easily be put in place.